Shipping figures for BlackBerry and TCL have been revealed: 850,000 BlackBerry devices were shipped in 2017. According to reports, BlackBerry management have been calling the year a success, especially in part due to the BlackBerry KEYone smartphone that was released in April 2017. Market analysts IDC stated that over 403 million smartphones were shipped in 4Q17. It has been reported that senior management at BlackBerry/TCL have been offering a positive outlook on BlackBerry’s future, regardless of the comparatively low shipping figures. The BlackBerry KEYone device with its dedicated keyboard and mid-range features (global version: 3 GB RAM, 32 GB storage, Snapdragon 625 SoC) was announced at the 2017 Mobile World Congress in Barcelona. It is likely it contributed considerably to BlackBerry’s shipping figure, but this is a tiny drop in the ocean compared to the 70 million+ units that both Apple and Samsung shipped in just the fourth quarter of last year. TCL Corporation is a Chinese manufacturer that made a deal with Canadian-based BlackBerry in 2016 to manufacture and ship devices under the still globally recognized brand name. 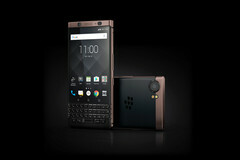 Notebookcheck reported on the news that at least two new BlackBerry devices are expected to be released in 2018, with one of them being a successor to the KEYone. It doesn't have to be a niche business. I would not be satisfied with market share in premium (phones) that is sub-1 percent forever. Apparently, the BlackBerry Mobile CCO is hoping to eventually attain figures of 3-5% for premium smartphone market share.